Be prepared for your next appliance repair with a 24 LED pivot work light. This light is small and compact, yet bright enough to illuminate dark work areas. The Blazing 24LED pivot work light is perfect for illuminating small, dark area and working compact environments such as inside appliances and under sinks. 24 LED 360 Degree Pivot Work Light with hook, magnet and hex base. It comes with a hook, magnet and hex base, which allows for a variety of placement positions. Hang it up by the hook, use the magnet to attach it to a metal surface or stand the light on its stable hex base to position the light where you most need it. The hook is attached to the base and can fold down inside the base when not needed. The light features a 360 degree rotating pivot head allowing you to direct light to any needed angle. It comes with three AAA batteries and hook. Purchase the 24 LED 360 Degree Pivot Work Light at EveryAppliancePart.com. It seems funny that an appliance you use for cleaning, needs cleaning itself. However, over time, build up from hard water minerals, soap, food and other debris can really affect your dishwasher’s ability to get your dishes clean. To prevent this — and larger repair bills down the road — clean your dishwasher regularly. Over time, mineral deposits from hard water, food, and detergent build-up and residue can really affect your dishwasher’s ability to clean. First, clean any glass, plastic, food or other debris that ends up near the drain filter at the bottom of your dishwasher. You can use either paper towels or a cloth to wipe around the bottom of your dishwasher. Be careful, as broken glass and other sharp objects can be hiding there, not easily seen. You can also use a dishwasher cleaner like affresh to clean your dishwasher, or use white vinegar to clean your machine. To use affresh, simply place a pod in your machine’s detergent dispenser and run a regular cycle. The detergent will help remove any mineral deposit build-up from hard water along with excess detergent and soap residue, mildew, smells and stains inside your dishwasher. If you want to go the homemade way, place your vinegar in a mug or bowl in the upper rack of your dishwasher and run a normal cycle using the hottest water possible. Stop your dishwasher in the middle of the cycle (before the wash cycle) while the bottom is full of water and pour two cups of white vinegar into the standing water in the bottom. Let it soak for 30 minutes and finish cleaning the wall of your dishwasher. Close the door and let your dishwasher finish the rest of its cycle. If you have any food stains on the inside of your dishwasher, use baking soda (a cup will do) and run it through a separate cycle after the vinegar cleaning. This will also add a fantastic clean smell to your dishwasher. Now might be a good time to also inspect your appliance; how do the dishwasher racks look? If you notice the plastic coating on your dishwasher racks broken or chipped off, you can repair them with a dishwasher rack tine repair kit. You can also buy dishwasher rack replacement roller parts so your dishwasher racks will move more smoothly when you load and unload dishes. However, if your racks are badly damaged and rusting and you have noticed rust stains in your appliance or on your dishes, it might be time to replace your dishwasher racks with new ones. Do you have any dishwasher cleaning tips? Shop tax-free for clothing, computer and other school-related supplies in these 16 states listed below, plus, get a list of all items that are included or excluded during the tax-free holiday. Back-to-school tax-free holidays start as early as July 25-26 in Mississippi, and run as late as August 16 for Maryland. Note, not all cities in the state participate in the tax-free holiday, so be sure to check the city or town you plan to shop in, before you head out. High-tech accessories such as printers, scanners, ink cartridges, cables and other gear, also qualify. Clothing up to $100 per item. Items not used for business purposes up to $2,500 per item. The holiday applies only to the 4 percent state sales tax. It does not apply to sales taxes levied by parishes, municipalities, school boards, and other political subdivisions of the state. Clothing, school supplies, computers, other – no limit. When doing back-to-school shopping, even during tax-free holidays, buy only what you really need for the start of school. If you can wait, items will be discounted at the end of the month, although selection might be sparse. Leave the kids at home, so you are more likely to stick to your list and avoid impulse buys from your children. Shop at dollar and discount stores over the summer and spread out your purchases. 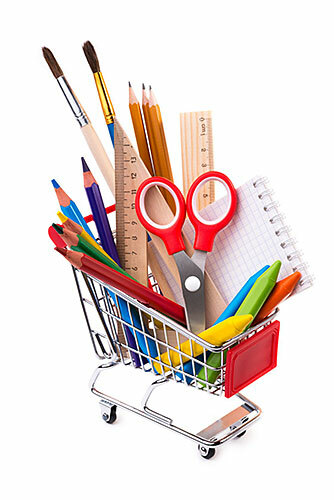 What are your back-to-school shopping tips? Leave them below in the comments. It’s time for a cutting board upgrade! Toss your old, marked-up and heavy cutting boards and get a set of four grip back cutting mats that not only stay put on the counter, but are also flexible, light, easy to clean (dishwasher-safe) and allows easy transfer of foods from the mat to your pan or bowl. 4 Pack of colored grip-back cutting mats made from polypropylene are stain and odor resistant and dishwasher safe. Made from polypropylene, these cutting mats are stain and odor resistant and dishwasher safe. Put these thin cutting boards in your dishwasher to clean and sterilize and you are done. The set of four mats help promote food safety as well. Health department officials advise consumers to use one cutting board for raw meat and another one for fresh fruits and vegetables. Professional cooks and restaurants go further and use color-coded boards to prevent cross contamination (one board for dairy, one for poultry, etc.) To be safe, use a separate cutting board for each type of meat you plan to prepare. The four colors in this cutting board mat package provide an easy way to remember which board you used for which ingredient to prevent cross contamination when prepping food. If you are concerned at all about salmonella or other bacteria, these boards are a good way to practice food safety and stop cross contamination. Each board has a hole in the corner edge making it easy to hang. They are light weight and thin, making it easy to store them in a drawer or cupboard. For more cutting board and food safety tips, read this article on the USDA site. Purchase this 4 Pack of colored grip back dishwasher safe cutting mats at EveryAppliancePart.com. Why is there water pooling at the bottom of my refrigerator? Water pooling at the bottom of your refrigerator or inside or underneath your vegetable crisper drawers is usually caused by a blocked or clogged defrost drain or tube. When your refrigerator defrost cycle runs, excess water collects in this tube and is sent through a drain and into an evaporation or condensation pan at the bottom of the refrigerator where the water naturally evaporates back into the air. Water pooling at the bottom of your refrigerator or inside or underneath your vegetable crisper drawers is usually caused by a blocked or clogged defrost drain or tube. Food debris and ice can block the line, parts that are part of the line (such as valves, etc. ), collection cup or the defrost drain, causing water to flow into or out of the fridge. To fix this, locate the drain on your refrigerator and flush it out using hot water applied through a turkey baster. You can also check the drainage tube for buildup of ice or other debris. You may need to remove a back panel or kick plate in order to get at this part (remember to unplug your refrigerator first). You can flush out any drainage tube parts with warm water or clean the ends with a pipe cleaner, small brush or cotton swab before reattaching the part. Make sure your evaporator or drain pan located underneath the refrigerator is not cracked or damaged. If it is, it might be spilling or leaking water out onto your floor. Replace the evaporator or drain pan with a new one. 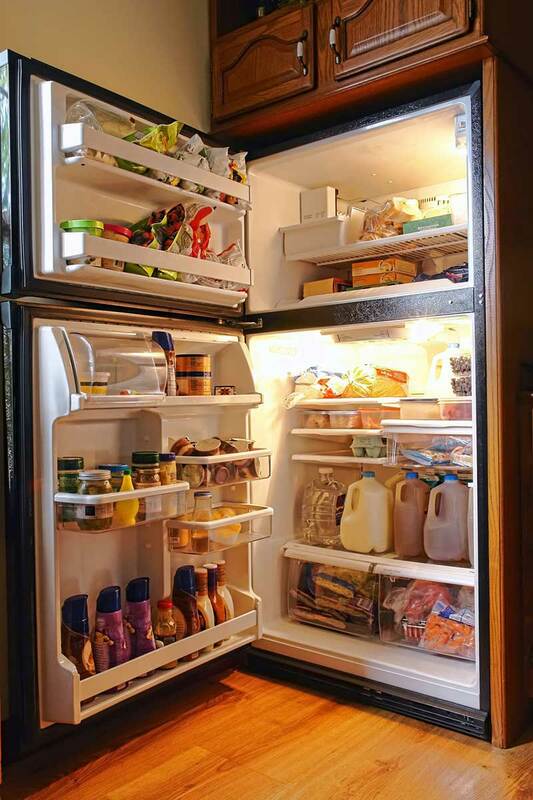 Check your refrigerator’s door gasket and make sure the seal is tight and free from damage. A worn or loose gasket might be causing more warm air than normal to enter your refrigerator, causing condensation on the walls of your refrigerator which then runs down the inside of your fridge and collects at the bottom of your refrigerator. If your refrigerator has a water or ice dispenser, check the tubing and connections to the water filter, water fill valve, icemaker inlet and dispenser inlet to make sure the connections to the tubing supply line are secure and there are no leaks. However, usually leaks only happen when the icemaker or water dispenser is being used. If you have an electric oven and it’s not heating up like it should (or at all) then you might have a faulty bake element. 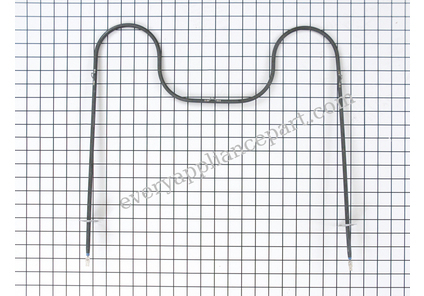 Sometimes, the bake element is visibly damaged or even falls apart altogether, so it’s easy to tell that you need a new electric oven bake element replacement part. 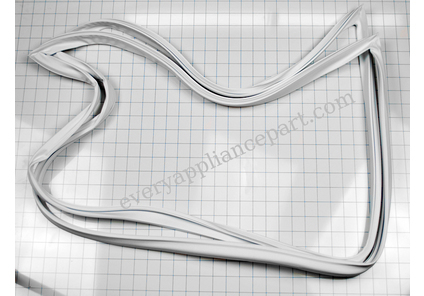 Once you have that, copy down the model number and enter it into the search box on EveryAppliancePart.com to find the right part for your appliance. Once you have your part, unplug your appliance or shut off the power to the appliance before you make your repair. Disconnect and remove your old bake element by removing the screws that hold the element in place to the inside back wall of your oven. Gently pull the old broken element forward. You will see that there are wires running to the element which provides the electricity in order to heat the element. You may need a pair of needle nose pliers to remove these wire leads. VERY IMPORTANT – don’t let these wires disappear through the holes into the body of your oven. If you do, you will need to remove the wall oven in order to get them back, which is a lot of work. Attach the wires to your new bake element (these usually slide in) and then push the new bake element into place. Replace the screws and you are done. Connect the power back to your electric range and turn your oven on to see if it works.